the lightness and colour of the movie. For example, a movie like “The Seventh Seal” by Bergman may be encoded with a QF of 0.18, whereas “Speed” will need 0.26. Then resolution is determined according to this value. Values in the range of 50-60% are recommended to obtain a good-looking encoding, 40% is still OK, in particular when using the B-Frames (see the codec options in the FAQ). Above 60% may be an overkill, under 40% may result in a lot of compression artifacts. All steps up to the resolution determination are identical to the normal mode. After entering the size of your medium, do a compressibility check using a targeted QF of 0.22 (the QF used for the CC does not modify the result of the test significantly). 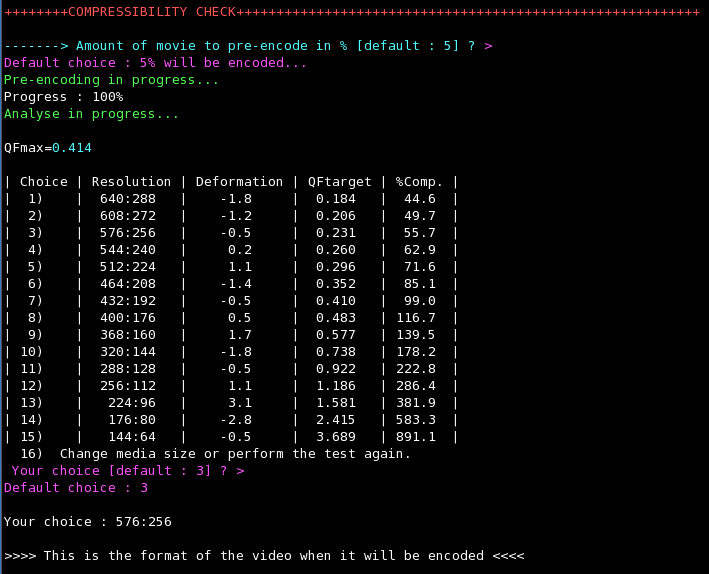 By default, the CC uses 5% of the film, but you may use a value comprised between 1 and 20%, the higher the longer the test is. Tuxrip then returns the maximum QF and calculates the possible resolutions, with the corresponding %comp. Type your choice for the resolution you want (choosing a resolution corresponding to 40-60%). You may also cancel this test and do it again with other encoding parameters (e.g. you may try 2 CD instead of 1 CD if the %comp values are too low).